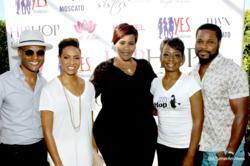 Star-studded BET Weekend Social Benefited Hip Hop Sisters Foundation, Produced by Y.E.S. Productions and Apixture provided the photo booth. We are excited to be a part of such a positive movement. To have the chance to work with a legend like MC Lyte and her organization Hip Hop Sisters, is amazing. We are happy the event was a success …YES Productions. Legendary lyricist, pioneer, and Hip Hop Sisters Foundation (HHSF) Founder / CEO MC Lyte and HHSF President Lynn Richardson kicked off the BET Experience weekend with a star-studded social to benefit MC Lyte’s non-profit charity, Hip Hop Sisters Foundation. With this being her first soiree of the most highly anticipated weekend in Los Angeles, MC Lyte and Hip Hop Sisters Foundation superseded expectations. Celebrities and VIPs in attendance included Advisory Board Members Kelly Price, Kenny Lattimore, and Malcolm Jamal Warner, along with Kym Whitley, MC Smooth, D-Nice, and Sheila E, to name a few. Approximately 300 tastemakers attended, including entertainment industry insiders, business executives, and community leaders, among others. In addition, the Ten-Ten Wilshire rooftop was tastefully transformed by event planners, Y.E.S. Productions..
MC Lyte gave a warm speech to welcome and thank her guests for their support. “Through the support we have received over the past year, Hip Hop Sisters Foundation has been able to touch the lives of our youth and empower them to take charge of their destiny. I would like to thank everyone for coming out to support us — including all of our sponsors and board members — and I extend a special thank you to YES Productions for making this happen,” Lyte said. In addition to enjoying the panoramic view of downtown Los Angeles, guests relaxed under the sun and mingled with some of Hollywood’s movers and shakers in the entertainment industry. The festivities included an open Ciroc Bar, food catered by Ladies Touch Catering, a MYX and Mingle Lounge and sounds by DJ Jahkova and celebrity guest dj, DJ Rebel. Produced by Hip Hop Sisters Foundation and Y.E.S. Productions, event sponsors included Ciroc, The Wright Holistic Day Spa, MYX Fusion, Ladies Touch Catering, Nestle Waters, The Ice Cream Lab and Apixture Photo booth. The gift bags were provided by Snack Factory Pretzel Crisps and included items by Shea Moisture, Hula Girl, MYX Fusions, The Wright Holistic Day Spa, Emeri Moscato, Lavish Beverages and Ten-Ten Wilshire. MC Lyte is the immediate past president of the LA Chapter of the Recording Academy (Grammys), the voice of the BET Awards Shows, mentor, speaker and actress with over 20 years in the entertainment business. Hip Hop Sisters is a non-profit foundation that promotes positive images of women of ethnic diversity, bringing together leaders from the world of Hip Hop, the entertainment industry, and the corporate world, providing national and international support to women and youth around the globe on the topics of cultural issues, financial empowerment, health and wellness, mentorship and educational opportunities. The Advisory Board members include Faith Evans, Ledisi, Jada Pinkett-Smith, Chilli, Russell Simmons, Cheryl “Salt” James, Malinda Williams, Lil Mama, Kelly Price, Fantasia, Malcolm Jamal Warner, Kenny Lattimore, Valeisha Butterfield, Jeff Johnson, Alesha Renee, Melanie Fiona, Rae Lewis Thornton, and Dr. Benjamin Chavis. Please visit http://www.hiphopsisters.org to see how you can get involved. Y.E.S. Production & Concierge is a full service event production, and lifestyle management firm located in Los Angeles, California. They specialize in event coordination, event management, marketing, branding and social media, as well as exotic car rentals, luxury home rentals and private jet charters. For more information, please visithttp://www.yesprods.com. The Wright Holistic Day Spa specializes in the rejuvenation of the body, mind and spirit. Services include signature facials, aromatherapy, body treatments and scrubs, organic skin care and mobile spa services (we bring the experience of luxurious spa services to your home of business). Please contact us at wrightholisticdayspa(at)gmail(dot)com for additional information.